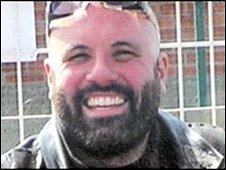 Two men have been convicted of murdering a Hells Angel as he rode home from a biker festival in Warwickshire. Simon Turner, 41, of Nuneaton, and Dane Garside, 42, of Coventry - both members of rival biker gang The Outlaws - were also found guilty of a firearms charge. Gerry Tobin, 35, of south-east London, was shot on the M40 in August 2007. Sean Creighton, 44, of Coventry, has already admitted murder. The jury was sent home without reaching verdicts on four other men accused of murder. 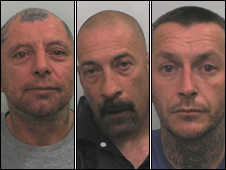 Karl Garside, 45, Malcolm Bull, 53, Dean Taylor, 47, and 46-year-old Ian Cameron have all pleaded not guilty to murder and firearms charges. Mr Tobin, who lived in Mottingham but was originally from Canada, had been returning from the Bulldog Bash festival held near Long Marston, south Warwickshire, when he was killed on 12 August. The trial was told he was targeted by members of the rival Outlaws motorcycle gang simply because he was a "fully patched" Hells Angel. Witnesses said a Rover car pulled up alongside him before two shots were fired. 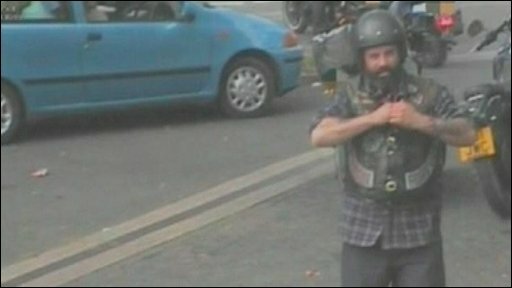 One hit Mr Tobin in the head, killing him instantly, while the second bullet struck his motorbike. It is alleged that his killers selected him as a target after waiting in a lay-by close to a motorway junction near Warwick. Garside had admitted during the eight-week trial that he was the driver of the Rover car from which Mr Tobin was shot, but denied playing any role in the killing. Turner had claimed he was at a workshop in Coventry at the time of the killing. He was also unanimously convicted of possessing two shotguns which were found in the city following the murder.